Bauma Exhibition will take place in Munich – April 11-17. 31st Edition of the World’s Leading Trade Fair for Construction Machinery, Building Material Machines, Mining Machines, Construction Vehicles and Construction Equipment. Caterpillar will exhibit a suite of technologies, services and equipment at bauma 2016 under the theme “Built for It.” More than 8200 square metres to showcase safety, productivity and equipment management solutions, as well as more than 60 Cat® products. Cat® Connect, Base hardware or software technology available for Cat or competitive equipment that performs a variety of tasks and provides information that can enhance customer operations. Cat® 360° Advantage, a joint commitment by Caterpillar and Cat dealers to deliver a full circle of expertise, technology-enabled equipment and support services that overcome jobsite challenges for customers. Leverage Every Litre, an educational initiative with tools, tips and resources that help Cat customers recover more profit from every litre of fuel they burn. Product Support services that protect the customer’s equipment investment and maximize its value. Dozens of machines for construction, mining, industrial, waste and forestry applications will be on display, all equipped with Cat technologies that improve safety, efficiency and customer success. 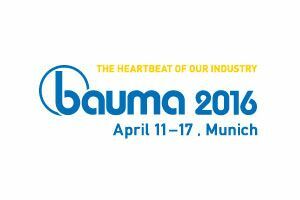 Share the post "BAUMA Exhibition – April 11 – 17, Munich"